CFL-605RT | Product | MIMAKI SINGAPORE PTE. LTD. The CFL-605RT supports material sizes up to A2 extra and has a variety of functions including eccentric, tangential, and reciprocating cuttings and creasing. 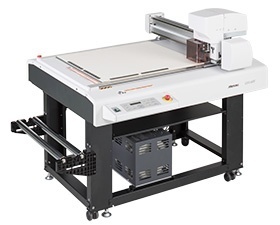 It is designed with Mimaki’s well-established technology, and supports on-demand production by multiple functions, including cutting and creasing. The CFL-605RT delivers efficient sample and package production. Use in combination with the UJF-6042MkII achieves on-demand production of the original goods by providing the whole production process, including printing onto goods and packages, and cutting of cushioning materials. * UJF-6042MkII is sold separately.